Includes loads of unique Mastersoft features! Kakuro is the latest craze to come from the land of the rising sun. Infact it's a bigger hit in Japan than SuDoku ! Mastersoft has done it again but this time the game name is Kakuro. Brace yourself! The addiction may hit you much harder than you may have been prepared for ... Rated 4.5 Stars (out of 5). Solving a SuDoku or Kakuro is immensely rewarding after spending time debating your moves, improving your skills, and exercising your mind. The implementations by Mastersoft are clean, easy to use, and do the job. As the Kakuro puzzles get more advanced, the Mastersoft tools supplied are extremely clever and really help. If you like logic puzzles, I recommend Mastersoft’s ingenious implementation of this game. Sounds simple but it gets hard and this game is as addictive as Sudoku! Compatible with Pocket PC and Windows Mobile. Square screen compatible eg hw6500 and Treo 700. Many Unique Mastersoft Features including Ball of String. Work your way up from Beginner to Kakuro Master ! Easily the most powerful Kakuro / Cross Sums game for PPC / WM. 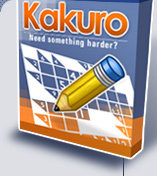 Six levels of difficulty including "Kakuro Master"
Designed with the help of over 100 Kakuro Players. Plays the way you want it to !